Masala murukku | Poondu murukku, the idea i got after the Popular Grand sweets in chennai. I saw the packet of Grand sweets Garlic masala thattai and saw the ingredients in that. First i thought i will make this as mini thattais, just like the Krishna sweets one. Since i have posted thattai and milagu thattai recipe, thought i will post this as murukku. It turned out very crispy and flavourful. In fact, the murukku turned out more flavorful the next day. 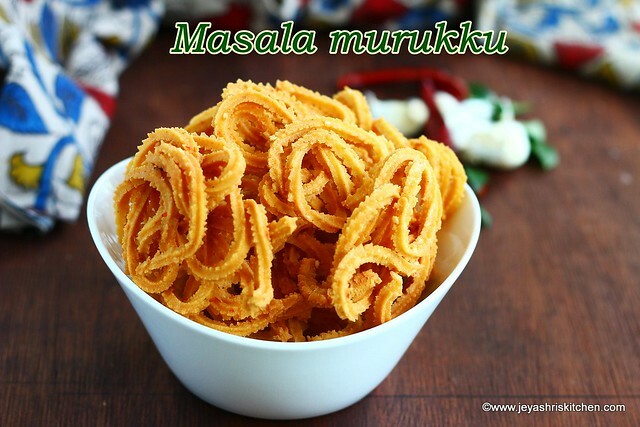 Try this easy masala murukku recipe for this diwali. 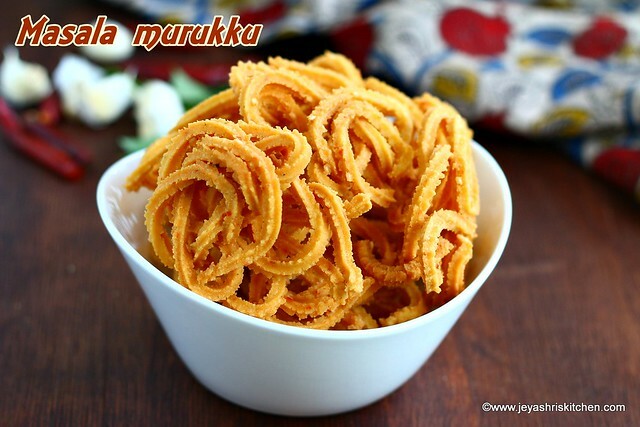 Preparation Time : 15 mins | Cooking Time : 30 Mins |Yields: 18 murukku approx. * I used 4 red chili but felt it can be little more spicy. **I used one pod of garlic but it was too less, if you want more garlicky flavour, add 3-4 pods. Soak the red chili, curry leaves and garlic pods in water for 15 minutes. Grind this into a fine paste along with coconut, using little water. In a wide bowl add the rice flour, urad dal flour, kadalaimavu(besan), butter, ground red chili paste, hot oil,salt and asafoetida. Add water little by little and make it a soft dough. I used the star achu (mullu murukku). You can use thenkuzhal achu also. Fill the murukku press with dough. Heat oil and once it becomes hot, keep the flame to medium. Squeeze the murukku into the oil. Let this cook till the oil sound subsides. Take out from oil and drain excess in kitchen towel. Repeat this for the rest of the dough. Store the murukku in an airtight container. Soak the red chili,curry leaves,coconut and garlic pods in water for 15 minutes. Grind this into a fine paste using little water. Do not make the dough in bulk, it will spoil the taste of the murukku. The flavor of the Masala murukku will be more the next day. The murukku will stay crispy and flavourful for a week.